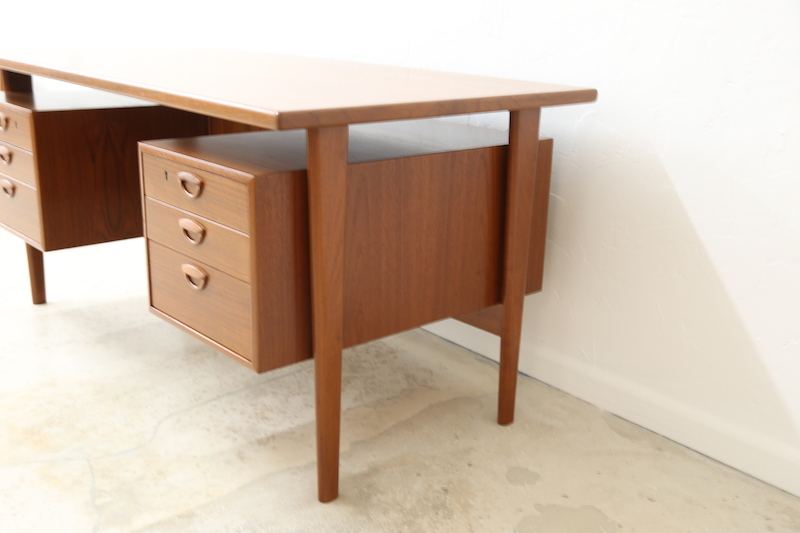 This desk is of a unique floating drawer design of the mid-century Model FM 60 by Kai Kristiansen for Feldballes Mobelfabrik. The piece has been refinished and is in excellent condition. 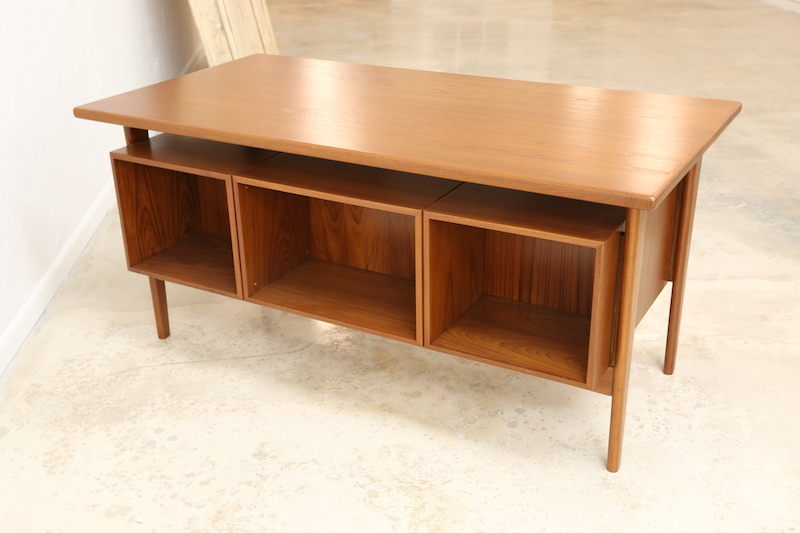 The desk has 6 drawers and 3 storage shelves in the front, great for displaying books and free-standing in any room. Made of teak. Seat clearance is 27.5 inches. Unique mid-century planter of Norwegian design with beautiful brass detail in excellent condition. A custom piece, perfect for a long corridor or as a room divider. The piece has been refinished, made out of oak. Obtained from a vendor in Norway who mentioned it was designed by Adolf Rastad and Rolf Relling, no markings but similar use of brass details, unique and of wonderful craftsmanship. A great little side table with beautiful copper detail in a 1970s style. To be used as a coffee table for a small apartment or end table between couches in L shape. Wood legs are in great condition, these easily screw off for storage. This pre-loved grey Alvar Aalto side table is a classic addition to any room. The table was designed in 1933 by Finnish designer Alvar Aalto, who is considered as one of the founding fathers of modern design. The bentwood solution of the Stool 60's L shaped leg is popular among all of Aalto's pieces. Not only was Aalto concerned with formal design but also in the spirit of beautiful materials and the simple forms of modernism. Aalto was a fan of artists such as Jean Arp and Brancusi. This table is in a lovely used condition, the grey laminate is in excellent condition, while the wood shows signs of history. Great side table or as a coffee table. Obtained directly in Helsinki from Artek 2nd cycle in Finland. 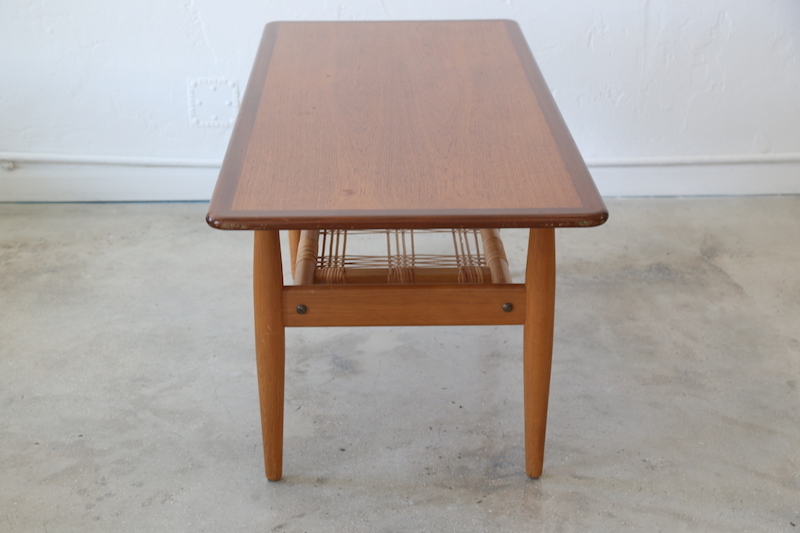 Beautiful ‘Frisco’ teak end table designed by Folke Ohlsson for Tingströms in Sweden. Raised lip or rolled edge on 2 sides. Solid sculpted legs with cross support bars. The top is in excellent condition as are the legs. Brand marked on underside. Wood grain is stunning. 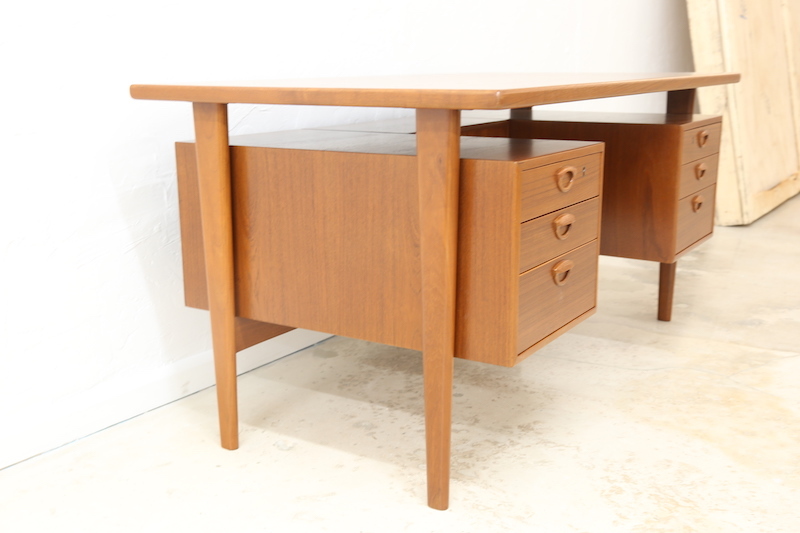 A classic dining table sold in the 60s by Danish department store Illums Bolighus in Copenhagen. 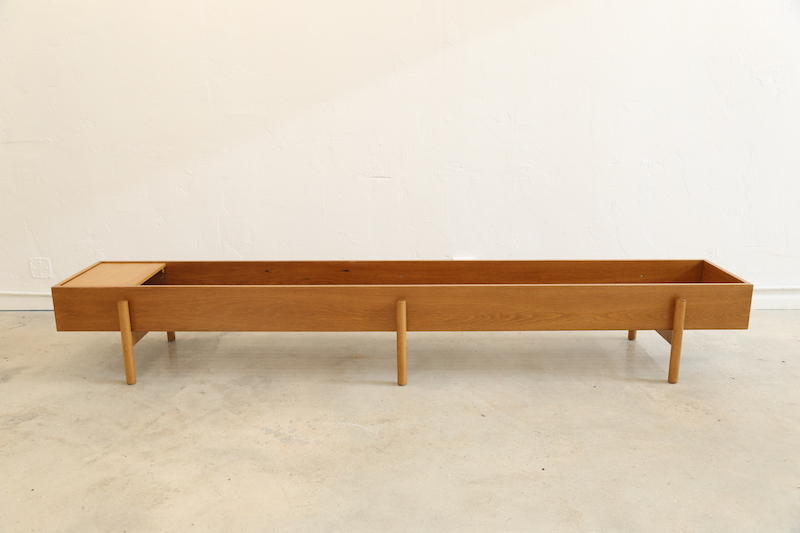 The table has 2 leaves that can be added or stored to sit 4 or 6 comfortably. The leaves can be stored under the table. The table has been refinished, beautiful wooden side detail. 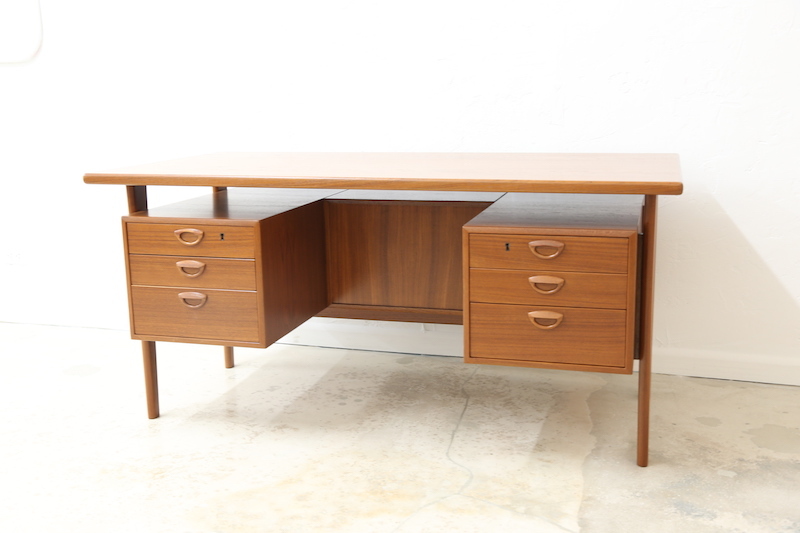 Clean mid-century lines. Total length with both leaves is 94.5 inches. Each leaf is 19.5 inches. 55 inches at it's smallest length.